The first D&D character to die in my old campaign was the not very originally named Hercules; he was killed by a fire beetle. This began my love affair with dungeon vermin -- giant rats, centipedes, spiders, and similar creatures. For some reason, they seem right, which is to say, they fit the kind of faux grittiness that I associate with D&D's default style of gameplay. Sure, everyone would much rather go toe to toe with goblins or orcs or whatever, but nothing says "old school" like getting the blood sucked out of you by a giant tick. Dungeon vermin are, I think, a necessary extension of Gygaxian naturalism. They're "transitional monsters" that mark the dividing line between the mundane ecology outside the dungeon and the fantastical one inside it. I find monstrous vermin to be, frankly, far creepier than stuff like bugbears or minotaurs, because they could be real. They exist in that twilight world between the unlikely and the impossible and, let's face it, you never know what zoologists are going to pull out of the jungles of Indonesia or the rainforests of the Amazon next. There are already some disturbingly large spiders and insects out there and, while the square-cube law prevents them from attaining D&D sizes, that's cold comfort to a guy like me, who's more than a little squeamish when it comes to creepy-crawlies. Some will no doubt argue that dungeon vermin are not "heroic" but, for me, that's a feature and not a bug (no pun intended). I remain firmly committed to the notion that 1st-level D&D characters are not heroes -- at least not yet. Poor old Hercules did not die a hero's death, but his death is remembered, if only because he'd waded into a combat, club in hand, that he should have avoided. His death was an object lesson in poor planning and the perils of leaping before you look. After all, how dangerous could a bunch of over-sized phosphorescent beetles be, right? I long harbored a grudge against dungeon vermin because an AD&D character I'd lovingly crafted over the course of a week in preparation for our first session died in the first room, having failed his save when a giant centipede bit him. These days I'm down with the Save vs Death as a "last chance" to save a character when the player has foolishly invited instant death. I was a little bothered that I got killed for trying to save the cleric from our first monster. I was even more annoyed when the critter nuzzled lovingly against the cleric's leg and tried to become her pet. The DM said, "Well duh, she's a cleric of the spider goddess." I said, "Dude, spiders eat centipedes. What's wrong with you?" The other players voted to kill the centipede on my behalf. The campaign lasted only two more sessions. Thanks for this post, James. I've been trying to get myself excited about dungeon vermin for a long time now...they just don't seem scary or threatening to me, and I worry my players will react the same way. 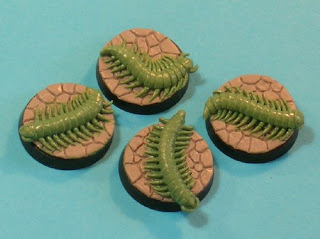 But now I think I'll just plop a few oil beetles and giant spiders into the outer crypts and see what happens. @ PatrickWR: "[V]ermin...just don't seem scary or threatening to me, and I worry my players will react the same way"
Thanks. Now you've just made me even more afraid of the creepy crawlies. No kidding, James. I've never watched more than 10 seconds of that myself! Okay, that was truly hideous. I don't know whether I made it through ten seconds or not. My obsession with vermin and how Chivalry and Sorcery played out got me calling my C&S game "caves & giant rats." (C&S giant rats are much nastier). I jumped right into C&S after getting my feet wet on Basic D&D, only really returning to D&D when I got my AD&D PHB. But yea, vermin (and the extension to clean up crew) are definitely signature parts of the D&D experience. From what work by Chaucer is that quote? I've looked but can't find it anywhere. The Chaucer quote is a joke, perpetrated by another blogger who's linked in the comment. A giant acid-spraying beetle killed a PC in a recent adventure session of my ongoing Thunder Rift campaign. He peeked under a bed and got hosed in the face.